In the 14th century, when the House of Luxembourg came to the throne in 1310, Bohemia was already a significant European region. In 1338, king John of Luxembourg granted the Old Town (called the Great Town then) permission to establish a city hall as a symbol of the town’s autonomy. The Old Town citizens had already bought a stone house in the square and began to build a tower, which was completed in 1364. It was under the rule of King John’s son, Charles IV (1316–1378), who became the Emperor in 1355, which was the most supreme secular position of the Christian world. He chose Prague as his royal seat; the town became the largest construction site of medieval Europe. In the tower of the city hall, a chapel built by Petr Parléř was consecrated in 1381. Mechanical wheel clock, a prerequisite for a hi-tech construction of that time, was not present on the tower yet. In the second half of the 14th century, there already were astronomical clocks in Europe: in Padua (1344), in Strasbourg (1352), in Lund (1380), in Stralsund and Doberan (both 1394) and in Wismar (around 1390). However, the machine of any of those clocks has not been preserved in such an original state as in Prague. The clock was installed on the Old Town tower in 1402 and there are three documented Prague horologists (clockmakers, in medieval meaning) from that time: Jan, Albert and Mikuláš. Older clockmaker Martin, already mentioned in the time of Charles IV’s rule, vouched for Mikuláš. It was under the rule of another Luxembourg, Wenceslaus IV (1361–1419); when the clock was being created. Its first mentions date back to 1410 (9th October), when its construction was completed. 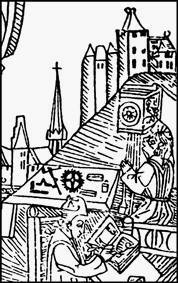 The burgomaster and the town council praised Master Mikuláš of Kadaň for excellent work, which is very accurately described in the document; the description implies that the work concerned was an astrolabe clock. As a reward, he was granted a house near the Havel Gate, considerable amount of cash (3000 gr. ), regular yearly salary (600 gr.) and property guarantees for him and his heirs. It was an above-standard reward, because for the amount was sufficient for buying e.g. 95 cows. The document is known as a later transcript and translation. Possible authorship of the idea of the astronomical clock is usually attributed to the astronomer Jan Ondřejův of Hradec Králové alias Šindel (1375?–1456), a mathematician, professor and vice-chancellor of the Prague University. He was a personal physician of King Wenceslaus IV and ranked among the most educated people in Europe. Another erudite person of that time comes into question as well – the mathematician Křišťan of Prachatice; it is also possible that the clockmaker Mikuláš could also have been able to design the astrolabe. There are no authentic records on this matter. At that time, the land was on the verge of the Hussite Wars, which disrupted Bohemia in political and economical terms for a long time. Bohemia became a troubled heart of Europe and the astronomical clock was usually forgotten. We do not know whether anybody maintained it. However, a written mention from 1459 of the clock was found. The horoscope for the day of 17th March in the library of Bohuslav Hasištejnský of Lobkovice explicitly states that the data was read on the Prague Astronomical Clock. Another mention is from 1490, when the clock was being repaired by a Prague clockmaker Jan Růže from Jilská Street, also known as Master Hanuš. He repaired the machine, improved it and added the calendar plate. He probably added the first movable sculpture, so-called “Clicker” – Death. Unlike the present sculpture, this one could move its jaws and was inspiration for several legends. These significant adjustments and the lapse of time of eighty years, when the original authors were already forgotten, caused that it was Hanuš who was considered to be the author of the clock for next 450 years. His longtime assistant, Jakub, perhaps his son, then maintained the clock until 1530. This clockmaker is usually identified with Jakub Čech (Zech), the author of the first portable spring clock in our lands. Jakub the clock-master did not have a successor. The only mentioned person is Jiří Zvůnek, the city hall treasurer, who nevertheless failed to understand the clock; a clockmaker was invited from Nurnberg but he was at his wits’ end as well. Zvůnek’s son, Václav, failed too. Another clockmaker, Jan Steinmaissel (another Hanuš?) from Platnéřská St., according to reports, returned the keys the other morning. Nevertheless, the astronomical clock got its saviour in the end – Jan Táborský of Klokotská Hora (1500–1572). As a young man, he attended lectures on astronomy and mathematics at university. In Prague, he ran a scribal and calligrafic workshop specialized mainly in large hymnbooks. He is also known as a writer, chronicler, composer and mechanician. When he was established as the clock-master of the astronomical clock in 1552, he was no longer a young man but he was very well prepared for his job. He maintained, repaired and improved the machine; he completed the automatic interconnections of individual parts of the clock. What is most important, though, he was the first to make a detailed technical description of the astronomical clock, which was included in his “Report on the Astronomical Clock...”, finished in 1570. It is an admirable manuscript, which also includes a large self-portrait. It is no wonder – Táborský was a top professional in the scribal industry. He took care of the clock until his death in 1572 with a break between 1556 and1560, when the clock was maintained by Jan Tobiáš. Táborský belongs to the most significant persons connected with the astronomical clock. In his historical research, he dated the making of the clock back to 1490 and thought Jan Růže to be the author. Nevertheless, he himself partially questioned this, when he admitted that he had not found older sources. He was a chronicler as well and he probably did not want to make up anything he did not have evidence for. It is a paradox that this is how the most widely known mystification about the Prague Astronomical Clock emerged; it was considered to be correct for four hundred years. 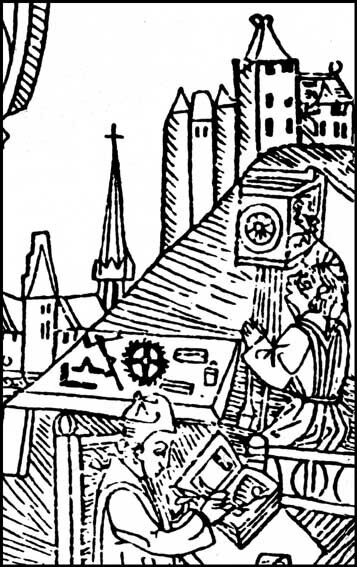 His contemporary, Tadeáš Hájek of Hájek (1525–1600), a Renaissance intellectual on the court of the Emperor Rudolph II, wrote a paper on geometry in 1557, where he added a note about Master Jan Šindel and believed him to be the author of the Prague Astronomical Clock (a finding from 1959). In 1587, however, an inconspicuous administrative act took place whose importance for the astronomical clock could not be appreciated until the middle of the 20th century. The councillors had Táborský’s report copied and made it available for clock-masters. The book was bound and it also contained blank pages for future notes in the same extent as the original text. The book was stored by the clock and then got lost. It turned up in a private collection in 1962, and this is when evidence of possible dating of the clock back to earlier time began to be collected. But let us respect chronology; we will get back to this issue later. After Táborský, it was his disciple Jakub Špaček who maintained the clock, according to sources until 1620, but there could have been some breaks. From that time, other names are mentioned such as Master Vavřinec, Šimon Podolský and Kryštof and Jiří Švarcpach. The astronomical clock was already two hundred years old and measuring time and astronomical data by means of astronomical clocks was gradually becoming an anachronism. There are still less reports on the Prague Astronomical Clock. There is a report on repair works from 1629 but it lacks details on the extent of the repair. At that time, armies were moving across Europe again; the Thirty Years’ War had begun. The repair in 1659 can be considered an important one, because the chiming machine was moved from the tower to the lower level next to the astronomical clock and wooden sculptures probably appeared on the facade. Death was already present because Táborský had already mentioned it, as Bohuslav Balbín (1621–1688), an intellectual and historian, did in 1681. The making of the unique hidden system of the rotation of the moon sphere is assumed to have taken place at the time of this repair; a special page is dedicated to this system here. There is no report on its creation, even though the book of notes was still present by the clock and the last dated record in it is from 1689. It is peculiar that nobody recorded such an essential modification. Hidden drives as a construction element did not begin to appear in clocks until a hundred years later. This is where a time gap begins. The machine was in standstill, there are not reports. It was not until 1760 when Jan Klein (1684–1762), a Jesuit mathematician and astronomer, took an interest in the clock. He was aware of its historical value. He himself had crafted several astronomical clocks in Klementinum and made an offer to the town council that he would put the clock into service and would only charge the cost of material. The town councillors did not response to his offer, and when extensive construction adjustments took place in the city hall in 1787, they wanted to throw it away. It looks unbelievable that help came from Klementinum again, this time an effective one. The director of the observatory, prof. Antonín Strnad (1747–1799) and the clockmaker Jan Landsberger repaired the machine in 1791 and saved it from destruction. They only repaired the clock machine; the astrolabe and the clock itself were out of order for almost another hundred years. At the threshold of the industrial revolution, the clock was out of order again but it was thoroughly documented by the clockmaker Romuald Božek (1814–1898). In 1848, the name of Prague clockmaker Ludvík Hainz (1813–1873) appears in connection with the astronomical clock for the first time. He ran a shop opposite the clock since 1836; he purged its outer surface. The attempt of the mayor Dr. V. Vaňka at a public gathering in 1861 was not successful and, as several times before, an intention to dispose of the machine arose. Nevertheless, there was a functional astronomical clock at that time. It was a room model made by Jan Prokeš (1818–1890) from Sobotka, who had studied the clock since 1857 and offered the town council that he would repair it. The town council rejected the proposal of the provincial clockmaker and established a committee. Let us remind the names of that time that appear in various contexts: the director of the observatory Dr. Josef Georg Böhm, the clockmakers Antonín Želízko, Ludvík Hainz, Josef Stibral, Jan Holub and Romuald Božek, the industrialist Čeněk Daněk, the burgomaster Dr. Václav Bělský, Prague archivist Karel Jaromír Erben, stonemason Karel Svoboda and, of course, painter Josef Mánes. The public gathering was successful this time, the yield in the amount of 4065 zl. covered the essential part of the budget. However, the preparations and repair works themselves did not proceed so smoothly. They were obstructed by many disputes about the competence, differences of opinions, personal conflicts and lobbyist relationships. Objections of other experts, including external ones, questioned the calculations and new adjustments made on the astrolabe. Jan Prokeš, who was initially rejected, made another offer that he would mend everything in a short time. However, his voice was completely drowned in this “battle of the clock”. The situation as well as the actual proceeding of the works were observed and commented on by the press with a great interest; the comments depended on whether the newspaper was Czech or German. Reports of the kind that even St. Thomas did not believe (according to tradition) in a successful repair because he had got stuck during tests and it was necessary to give him a push, are ridiculous. The Apostles, reportedly, did not appear at night because they were disguised little children who had to sleep at night. Jan Neruda also made some ironic comments concerning the situation; however, he was it fair towards both sides. Josef Mánes painted the calendar plate. The astronomical clock was inaugurated with a great celebration on 1st January 1866, still without Mánes’ calendar plate but already with the Apostles, we refer about the problems with dating it elsewhere. In August of that year, the clock was stopped again and defects of the machines were repaired discreetly. The clock acquired the essential part of its present appearance and became a permanent artifact of Prague. It was stopped for several years before the end of the 19th century (1880–1883) but this was due to the reconstruction of the tower. The clock also acquired its last outside attribute, the cockerel. In 1911, prof. Dr. Václav Rosický held a series of lectures on the astronomical clock. The clock was undergoing an extensive maintenance at that time; it was adjusted to the Central European Time, the sun dial was completely removed and the sculptures were renovated by a young sculptor V. Sucharda. After the World War I, V. Rosický prepared a book, which was the first one to describe the clock at the full extent in both historical and technical terms; it was published in 1923 by the Otto Publishing House. Let us remark that this book remained the only one of its kind for a long time – until 1988, when Zd. Horský wrote another book about the astronomical clock. It could seem that the astronomical clock had overcome all threats of destruction. However, just a few hours before the end of the World War II, on 8th May 1945, the tower, Neo-Gothic eastern wing and archive of the Old Town City Hall burned down after being hit by a incendiary grenade. The astronomical clock with its wooden sculptures burned down as well, and being supported by an internal wooden structure, it crashed down. During the first days of peace, voices arose again (and even from the expert community) that the clock should be replaced with a new one. The postwar years were characterized by a leftist radicalization of the Czech society; this is why the reconstruction of the city hall, astronomical clock and, in metaphorical meaning, the old social order were not dealt with. So-called “Victorious February” (or else “Czech Coup”) in 1948 meant the victory of so-called working class. Shortly after this, on 1st July 1948, the clock was back in order. Away from the political events, hidden in their workshop, Vesecký brothers were repairing deformed and broken parts and assembling the machine again. Meanwhile, Vojtěch Sucharda had carved new Apostles, as we described in a special chapter. So today, over sixty years later, the clock is turning and shows what it showed six hundred years ago. With around three quarters of old original parts, it is still in operation. It is the best preserved machine of its kind in the whole world. For completeness’ sake, it should be mentioned that its last, this time modern, device was installed in 1957. It is an automatic transmission for the pendulous movement of the Old Czech Time ring, so-called 24-hour dial. The complex mechanism is interesting in such a degree that we will devote a special chapter to it. There was another principal event awaiting the astronomical clock. A copy of J. Táborský’s Report was found in a private collection, with notes made by the clock-masters in the 17th century; this archive document had not been known until then. The first who pointed it out was Dr. Stanislav Macháček in 1962. In the report, the word “error” is added to the original dating back to 1490 (see the archive, go to page 23); a German copy together with its Czech translation of 9th October 1410 is attached on loose sheets (pages 51 and 53). A document issued by the burgomaster and council of the Old Town of Prague states that Master Mikuláš of Kadaň constructed a clock with an astrolabe for the Old Town City Hall. The document contains quite detailed description of the clock. This information in itself would not be sufficient for a new dating. The astronomer, mathematician and historian Dr. Zdeněk Horský (1929–1988) searched the archives for many years and collected fragments of information. He managed to put them together to a mosaic that made sense, and the result was surprising. The dating of the astronomical clock was shifted back to the pre-Hussite times, exactly to 1410. Dr. Horský summarized his research in the manuscript of his extensive book in 1983 but he did not live to see it being published in 1988. It is only the second comprehensive book about the astronomical clock and it is a fundamental one for its content. Most part of the expert community accepts his evidence and opinions; we adhered to them as well while working on this web presentation. Good technical condition of the clock must of course be credited to its modern clock-masters as well. Vesecký brothers, mentioned above, maintained it for several decades; their apprentice Josef Valášek carried on with their work after them. He also trained his successor, a clock-master named Otakar Zámečník, who managed the last great repairs and renovations in 1994 and 2005. In 2005, the clock was, after sixty years, completely disassembled; only its historical frame remained on the machine floor, having been embedded in concrete in 1948. Many parts needed repair or renovations. This also applied to eight outside sculptures, which were renovated by Jiří Matějíček, a painter. It was during this renovation when most of the documentation presented on our website was created. It was an opportunity that had to be taken with the perspective of the clock’s 600th anniversary in 2010. The astronomical clock is not under a specific protection as a monument; however, it is a cultural monument as a part of the Old Town City Hall. At present, it is the sculptor and restorer of tower clocks Petr Skála and the astronomer RNDr. Zdislav Šíma who are in charge of the maintenance of the clock.